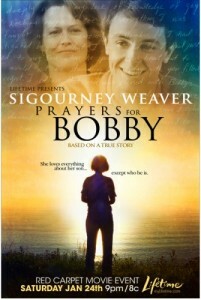 Prayers for Bobby is a 2009 television film that premiered on the Lifetime network on January 24, 2009. It is based on the book, Prayers for Bobby: A Mother’s Coming to Terms with the Suicide of Her Gay Son, by Leroy F. Aarons, which is itself based on the true story of the life and legacy of Bobby Griffith, a young gay man who killed himself in 1983 due to his mother’s and community’s homophobia. The film stars Ryan Kelley as Bobby Griffith and Sigourney Weaver as his mother, Mary. The film was nominated for two Primetime Emmy Awards (Outstanding Made for Television Movie; Outstanding Lead Actress in a Miniseries or a Movie – Sigourney Weaver). In the same category, Sigourney Weaver was also nominated for the 2010 Golden Globe Award, as well as the 2010 Screen Actors Guild Award. The film won the 2010 GLAAD Award, and the producers were nominated for the 2010 Producers Guild of America Award. The film won the Audience Favorite Award at the Seattle Gay and Lesbian Film Festival.